And I mean really weird. From producing eerie, smeared convolutions of files to manipulating the spectrum of a sound in ways that are actually unlistenable (as in, they cause excruciating pain), Mammut is delightfully un-commercial and totally unpredictable. Here’s how this all started. Last week, I noticed that popular time stretching algorithm PaulStretch had found its way into a convenient plug-in form for Mac and Windows. That opened the floodgates to lots of discussion of where to find similar tools. There’s some beautiful stuff in there. In addition to being able to edit a spectrum directly, you can apply more beautiful time stretching and features like convolution, which combines audio waveforms by spectra. Mammut is a rather unpredictable program, and the user must get used to letting go of control over the time axis. The sounding results are often surprising and exciting. Mammut is also ideal for common operations such as filtering, spectrum shift and convolution and it provides an optimal performance. Mammut is old software, from pre-2007, but thanks to being built in the free JUCE environment still compiles and runs nicely. It’s a project of Notam, the electronic art research center in Oslo, and developed by Øyvind Hammer, with a UI by Kjetil Matheussen. 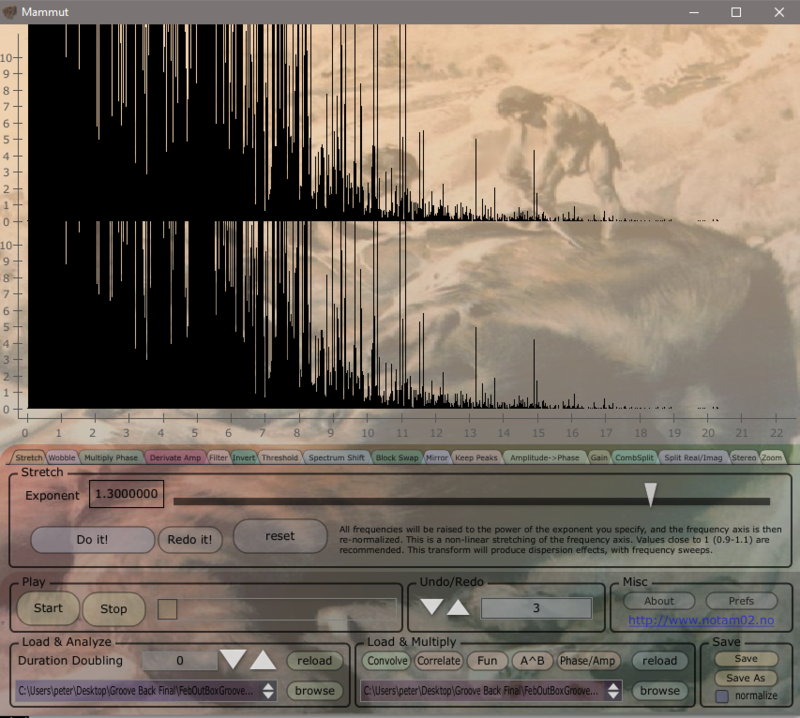 The “mammoth” reference is because it takes the FFT of the whole sound file at once instead of using windows / chunks of the sound. While the results here are radical, similar techniques find more practical applications – like building a smooth waveform pad synth. Anyway, I suspect you can from here go down either a link hole looking at that research and the engineering side, or get lost playing with sounds. In honor of Mammut, I think it’s also only appropriate to paste in this film – enjoy! Thanks to Jhh Löwengard for the tip!